One intriguing image stands out among the many unusual photographs in Désiré-Magloire Bourneville and Paul Régnard’s Iconographie photographique de la Salpêtrière (1876-80). A woman sits next to an immense tuning fork, her neatly coiffed head tilted to one side and an expression of deep concentration on her face. The sheer size of the fork is astonishing, as is the claim that the image depicts “catalepsy provoked by the sound of a tuning fork.” I interpret this image as a literal snapshot of the idea that specific kinds of sound had privileged access to the nerves, a motif that haunts the long nineteenth century and continues to resonate into the present day. This photograph is one of a number of cases documenting Jean-Martin Charcot’s experiments with acoustic stimuli on asylum patients at the Salpêtrière. Charcot (1825-1893) is generally regarded as the founder of modern neurology. He was the first physician to describe multiple scleroses and to outline its stages of progression, and made significant advances in understanding the psychopathology of epilepsy, Parkinson’s disease, and Lou Gehrig’s disease. 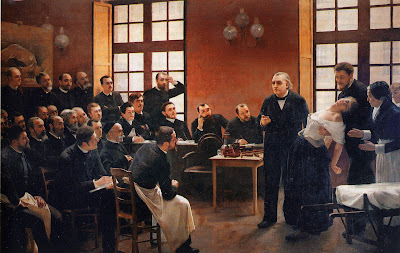 Charcot held the first chair in nervous diseases at the Salpêtrière, and his students, a veritable who’s who list of pioneering neurologists, included Sigmund Freud, Giles de la Tourette, and Joseph Babinski. André Brouillet, “A Clinical Lesson at the Salpêtrière (1887). Joseph Babinski supports a fainting Blanche Wittman (one of Charcot’s most famous hysterics); Charcot stands to her left. De la Tourette is seated up front in the apron, next to him in the cap is Romain Vigoreux, head researcher of medical electricity. A full list of the physicians depicted in the audience can be found here. The patients, Gl— and B—, are seated over the sounding box of a strong tuning fork, made of bell metal, vibrating sixty-four times in a second. It is set in vibration by means of a wooden rod with which the branches are violently separated, or a bow is drawn across its open extremity. After a few moments the patients become cataleptic, the eyes remain open, they appear absorbed, are no longer conscious of what passes around them, and their limbs preserve the different attitudes which have been given them. 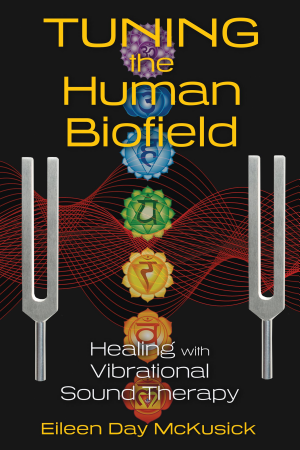 If the vibrations of the tuning fork are abruptly arrested, the laryngeal sound is heard immediately, the limbs fall into a state of resolution and the patients at once become lethargic. Right: Patient hypnotized by the sound of a tuning fork. Karoly Laufenauer, Eloadasok az idege let vilagabo 1 (Lectures in the World of Nerve-Life 1) Budapest: Kiralyi Magyar Terme szettudomanyi Tarsulat, 1899. 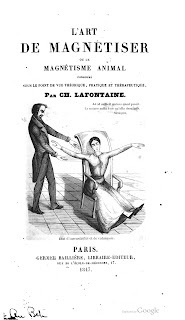 Charcot’s invocation of catalepsy is distinct from modern-day applications of the term. According to The Cyclopædia of Practical Medicine (1833), catalepsy was “characterized by the sudden suspension of consciousness and of voluntary motion, the muscles continuing steadily in that state of contraction in which they happened to be at the instant of the attack—and yet readily admitting of, and retaining any other position of the body and limbs, however inconvenient, in which they may be placed at the will of the bye-standers.” Cataleptic fits could arise from a disease of the mind or body, or be provoked by hypnosis. Indeed, the distinction was of little importance, as in all cases the condition was assumed to have physiological correlates. Right: Plate 34. 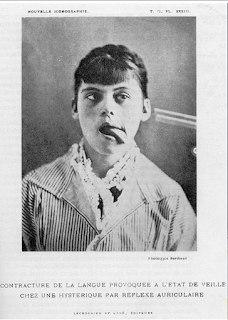 Tongue contraction in a hysteric patient (awake) caused by an auricular reflex. 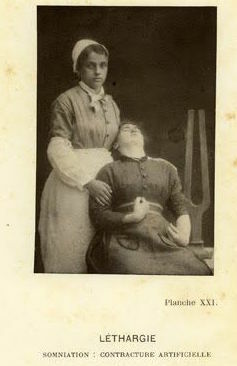 Catalepsy could be treated by various means, including music. In earlier research, I focused on a number of accounts of early nineteenth-century cataleptics cured by the sounds of the harmonium, a new instrument invented in 1809 whose ethereal sounds were held to have privileged access to the nervous system. This was already a variation on a familiar trope, in that half a century earlier the German physician Franz Mesmer had used the celestial tones of the glass armonica to allegedly amplify the influence of an invisible magnetic fluid on his patient’s nerves. Charcot’s acoustic experiments on his hysterical patients appear to represent a further iteration of the trope of nervous sounds, now projected onto the tuning fork, a musical instrument with eminent scientific associations. 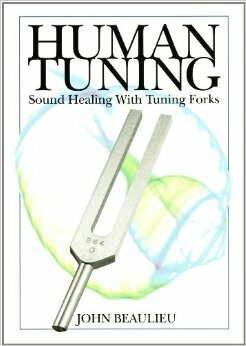 Invented in the eighteenth century by the English trumpet player John Shore, tuning forks were later coopted by acousticians and physiologists to investigate speech, sound, and timing. Moreover, they were (and continue to be) part and parcel of a neurologist’s toolkit. 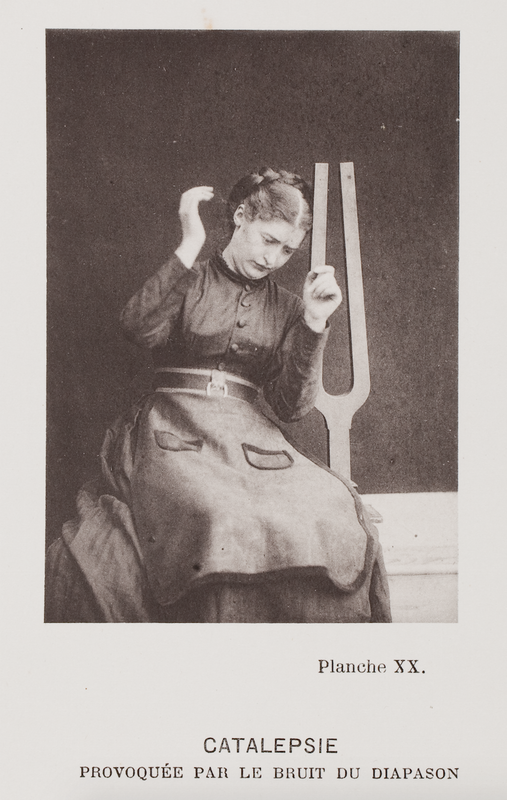 The Weber tuning fork test, invented by Eduard Schmalz in 1845, and the Rinne tuning fork test, invented by Heinrich Adolf Rinne a decade later, employed tuning forks to examine whether hearing loss was conductive, neurological, or hysterical. 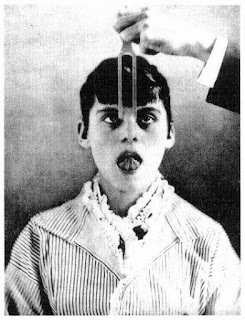 These exams, conducted by placing a ringing fork on the patient’s skull and upper jaw, respectively, were part of the standard neurological battery at the Salpêtrière. Charcot’s interest in tuning forks had an additional dimension: the fact that the instruments provided powerful, long-lasting vibrations. Having noticed that some of his patients suffering from Parkinson’s disease appeared to obtain temporary relief from their symptoms following a bumpy train ride, he developed a vibrating chair to simulate these effects. As reported in Nature (1892), “To a healthy person the experience is execrable…not so the patient, however; he enjoys the shaking, and after a quarter of an hour of it, is another man.” Working with Charcot, de la Tourette adapted this principle in designing a vibrating helmet to treat neuralgia. The device with which we opened this blogpost, comprising a giant tuning fork set upon a resonating bench, was designed by Charcot’s colleague Romain Vigoreaux in order to treat hysterics as well as patients with locomotor ataxia. 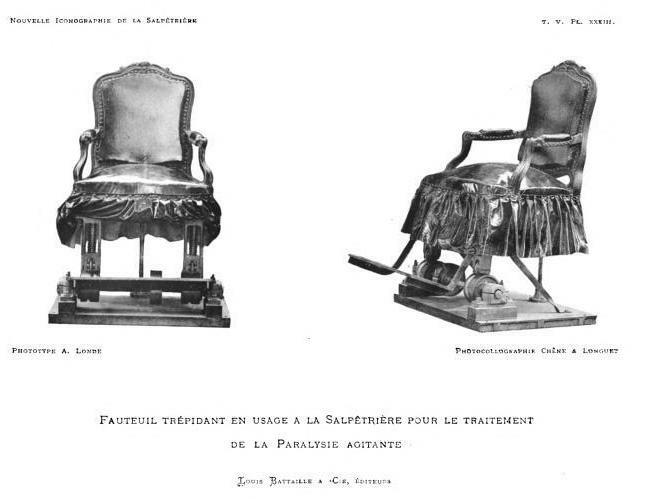 Charcot’s vibrating chair. Image from Nouvelle iconographie de la Salpêtrière, Vol. 5, 270b. The idea that vibrations afford privileged access to the nerves predates Charcot, going back at least to Enlightenment thinkers such as Isaac Newton (1642-1727), David Hartley (1705-1757), and Charles Bonnet (1720-1793). However, it continues to exert power in our present day, both in alternative medicine (c.f. 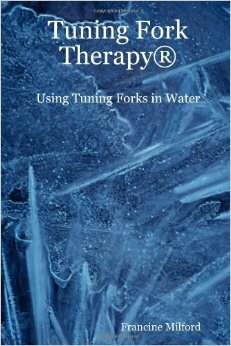 the contemporary practice of using tuning forks for healing purposes), as well in mainstream medical treatments. 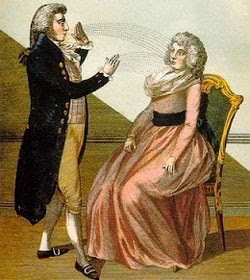 For example, a twenty-first-century variant on Charcot’s procedure of treating Parkinson’s disease with vibrations can be found in the technique of deep brain stimulation, in which a surgically implanted electrode transmits electric vibrations directly into the patient’s basal ganglia. The exact mechanism by which this procedure relieves a patient’s symptoms is not entirely understood, but it relies upon the same insight expressed in Charcot’s acoustical experiments with the tuning fork: the idea that vibrations cause material changes within the brain. The images from the Iconographie photographique may jar our modern sensibilities. 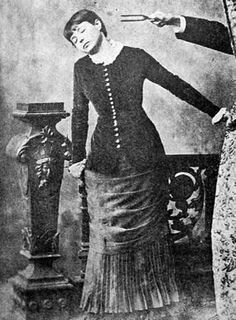 Yet they show how conceptions of the neurophysiological impact of certain timbres might have influenced the soundscape of Charcot’s clinical demonstrations at the Salpêtrière and the diagnosis of hysteria more broadly. They also remind us that the modern-day employment of music, resonance, and vibration in contemporary neuroscience, neurology, and alternative medicine constitutes part of a long and continuous tradition of using sound to affect changes in the mind and body. Carmel Raz is a Fellow at the Society of Fellows in the Humanities at Columbia University. She is working on a monograph on music and neural science in the long nineteenth century. Gershwin and Color: How Blue is the Rhapsody? The Voice Returns: New Season, Same Blind Spot?